Building bridges with the communities and regions that host UWC schools and colleges across the globe is a vital and ongoing way of helping people understand the impact of the local educational institution, the global mission of the United World Colleges Movement and the reach of its 60,000-strong alumni embedded in influential positions around the world. At Pearson College UWC, building community understanding and awareness with stakeholders other than alumni is a serious undertaking that requires team effort and one that operates on a number of formal and informal levels simultaneously. Formal outreach includes meeting with decision-makers at all levels of government — in Canada that includes relationships with municipal, provincial or territorial, federal and, in many cases, First Nations governments. Decision-makers can be elected, or they can be professional and qualified public servants who offer elected law-makers their considered and unbiased advice. Similar relationship-building happens every day with individuals and organizations who support, or are considering supporting, scholarship by donating to or partnering with Pearson and the UWC Movement. Many individuals and organizations (charitable, social justice, business, etc.) want to ensure that their support or partnership has the most positive impact possible on the school but also that it aligns with their own goals and objectives. That usually means discussions, meetings and compromise to ensure that, to the greatest extent possible, the needs of all parties are met. Those interactions can be formal or informal. Similarly, connecting effectively with the local business community and becoming involved with business and similar organizations – such as Chambers of Commerce — are important strategies. Such relationships not only help build bridges and understanding, they can also bear fruit in terms of discounts and donations in kind to support a charitably-registered school like Pearson. Recent One World sponsorships and significant discounts on student housing renovations are just two examples of how important these relationships can be. That’s not to say though, that “informal” get-togethers – those at which no “business” is expected to be discussed – are taken lightly or casually. A recent “informal” gathering, for example, required a significant investment of time, planning and negotiations to bring together about 200 of the region’s most influential leaders with the individuals leading both Pearson and worldwide UWC Movement. 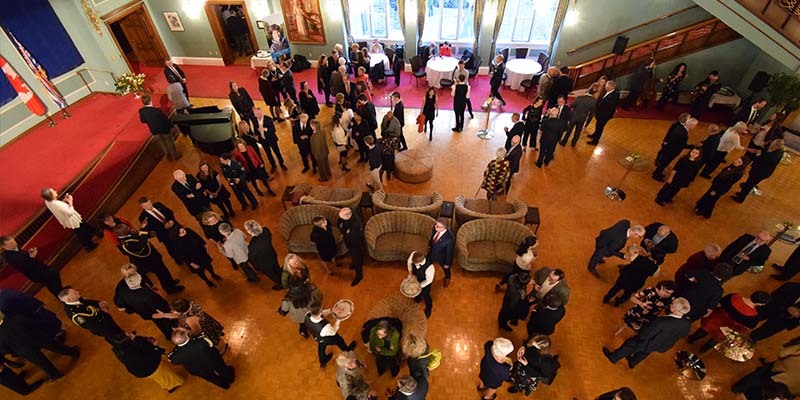 The official kickoff to the recent worldwide biannual UWC meetings – the first such gathering hosted by Pearson in nearly two decades – was a reception at the British Columbia Lieutenant Governor ’s official residence hosted by Her Honour Janet Austin. It was a chance for 200 people from across the Greater Victoria and Vancouver Island communities to meet both the provincial vice-regal representative as well as special guest Her Excellency, Canada’s Governor General Julie Payette (an alumna of UWC Atlantic) and to learn more about Pearson from Désirée McGraw and her entire outreach team. With the UWC international representatives in attendance, plus local Pearson alumni as well as staff and faculty, this was an excellent opportunity to demonstrate that Pearson is anything but “just another global school.” It’s fair to say that most people came away from that gathering with a better sense of how Pearson and its students contribute to a deeper and richer local understanding of the fact that “global affairs” is not simply an abstraction but something that touches all of us. And, in this year in which Pearson is marking Women’s Empowerment we were particularly delighted that one of our guests, Catherine Holt, CEO of the Greater Victoria Chamber of Commerce, made an interesting observation about the gathering in her recent column in the Victoria Times Colonist.